I did a DesktopGL project and I decided to change the taskbar icon, I tried to change the .ico file and the .bmp file but without success, can someone help me? For DesktopGL, I also had to replace the Icon.bmp file with my own 32-bit BMP with an alpha channel. I had the alpha channel handled with PixelFormer. Here's a great post on how to do so. The .ico should work just by replacing it with your own. How are you creating the file? First I apologize if I have not responded before but I had problems with login page. I forgot to mention that I tried to edit the monogame icon and change it with the default Icon. For the game icon I used Gimp(When I exported the image, i simply changed the extension) and for the edited file I used Paint. Gimp (and Photoshop) don't properly support exporting alpha channels with BMP unlike PixelFormer, so if you want proper transparency you'll have to use it or other software that does support it properly. Do the icons remain the same when you change them? Yes, the icon remain the same. 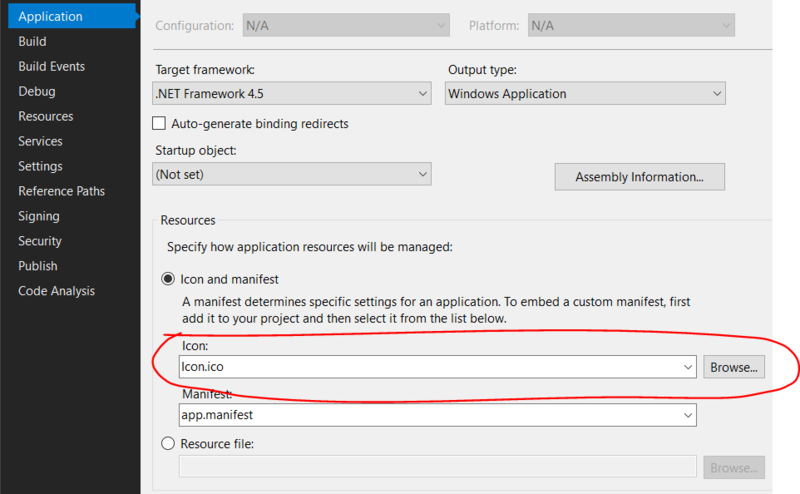 Try changing the icon in project properties to the new icon even if the name is the same. The icon is also likely cached which might prevent the new one from displaying. Here's a guide to clearing the icon cache. I did this before setting the icon to my game. Ah, you meant this icon, sorry my fault... This I was able to change it.